While the last few walks have covered taste receptors, I'm more interested in the central representation of taste. When you taste something the information is relayed from the taste receptors by three facial nerves to the brainstem (NST), then to the thalamus (VPMpc), and from there to gustatory cortex (GC). The NST also projects to the amygdala and lateral hypothalamus, sending reward and feeding intake information. There aren't a lot of labs that study taste coding in GC, but one of the best labs is Donald Katz's at Brandeis. He's done some interesting work on ensemble representations of taste, but today I will cover his neuroscience origin story. As a post-doc he worked with Sid Simon at Duke, and put out two nice papers about taste coding in GC, which I will review here. 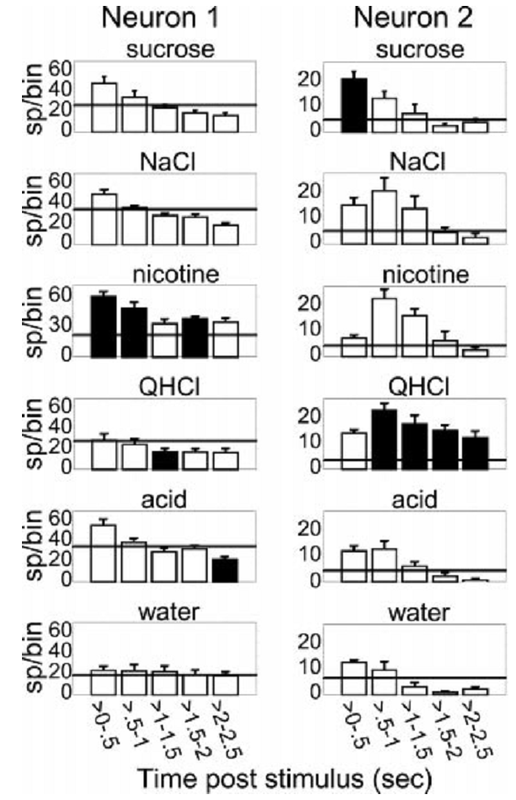 In the first paper, they simply recorded from GC (and oral SC) neurons in awake rats while they licked four basic tastants: sweet, sour, salty, and bitter. When they calculated the taste responses over the 2.5s following a lick, 14% of the neurons responded to at least one taste, which was in line with previous reports. However, if they instead binned the responses into 500ms chunks, they found that the number of responsive neurons increased to 33%. The dynamics of the responses were different for each neuron, with some changing their "preferred tastants" in each time bin. The responses of two neurons in 500ms bins. Neuron 1 has a similar response, scaled, to each tastants. Neuron 2 has different dynamics for each tastant. For example in the figure above, neurons 1 and 2 have different preferred tastants in different bins (counting inhibition as "preferred" since it's still information). And when they further smoothed their analysis by using a moving average of the response, 40% of the neurons responded to tastants. Given the complex dynamics of the response, they next asked if different information was represented at different times. 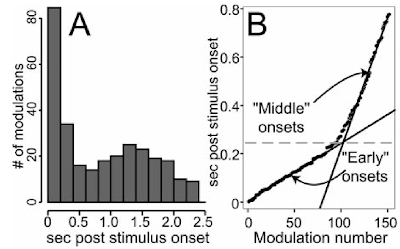 To do this they identified "modulations" in the continuous response, either inhibitory or excitatory. Then they made a histogram of the modulation onset times, and found they were bimodally distributed (panel A). A. GC neurons modulations are bimodally distributed <0.5s and 1-1.5s. B. 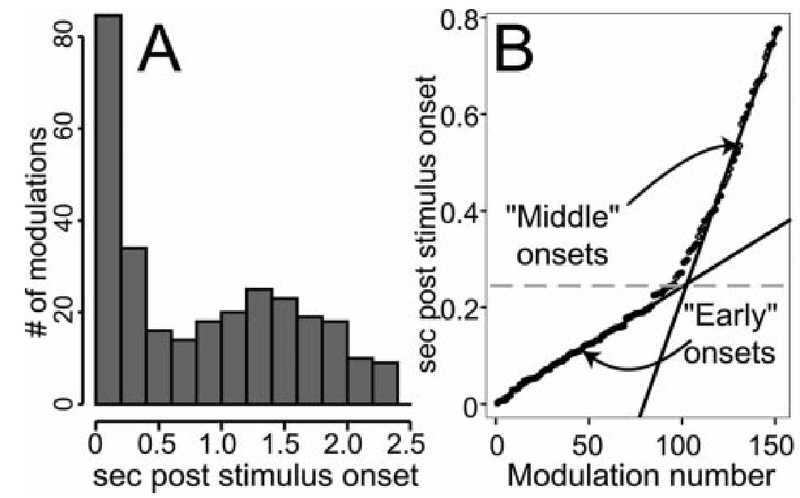 A closer analysis of the early responses shows there is another division of responses around ~250ms. From Katz et al 2001. Some modulations started early, with an onset time of <0.5s, while others started later, >1s. They then looked even closer at the early onset times, and plotted just those within the first 0.8s (right panel above). Here they found that a set of onset times seemed to cluster <0.25s, while the rest were distributed >0.25s. Thus there were three modulation windows: 0-250ms, 0.25-1s, and >1s. They hypothesized that the early and late onset times were due to orofacial movements like licking, or facial gestures made in response to palatable (or not) tastes. If this were true, since licking occurs at 5-10Hz, one would expect the early and late responses to have information at 5-10Hz range. To see this, they performed FFT on the responses, and looked at the power spectra of the early, middle, and late responses. And indeed the early and late responses had more power in the 5-10Hz range. Given this they concluded that GC neurons encoded different information at different times of the response. 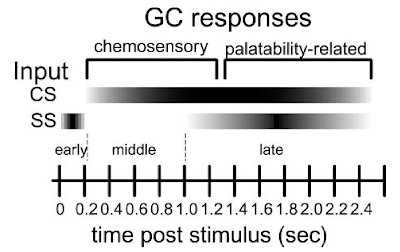 GC neurons encode three types of responses over different time scales. Early, somatosensory licking info, "middle" taste info, and finally palatability. This is probably hindsight bias, but I can't believe it took so long for GC scientists to look at the temporal dynamics of taste coding. In the discussion section, they cite research in the olfactory bulb, motor cortex, and visual cortex that all investigated temporal dynamics years earlier (frankly, mid-90s seems late). And using temporal dynamics completely changes the picture of GC: the number of taste-responsive neurons jumped from 10 to 40%! GC went from being a tangentially taste-related cortex to being obviously taste specific. All the papers since then have confirmed that indeed, 40% of neurons are taste responsive. 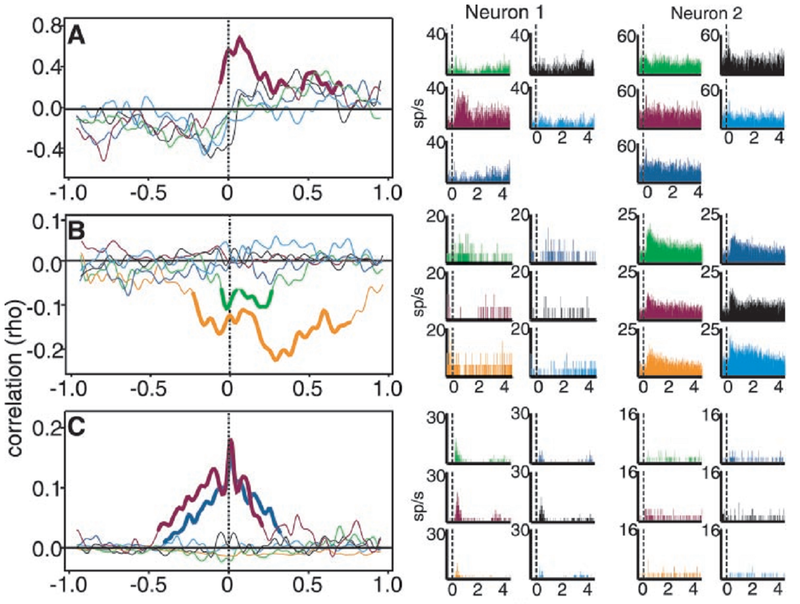 To follow this work on single neuron representations, Katz Simon, and Nicolelis next turned to the population response. This was done by simply calculating the cross-correlation (CC) between the firing rates of pairs of neurons (the paper includes more sophisticated analyses like linear discriminant analysis, but the CC result is cleanest). They recorded 237 pairs of neurons, sometimes in both hemispheres, in 12 rats. Of the 237 pairs, 85 had changes in CC due to specific tastants. Three example neuron pairs. On left are CCs for the pairs (how often neuron 2 fired following neuron 1); on right are the individual neurons' responses to tastants. A. This pair of neurons had different PSTHs, but an increase in CC. B. An example of inhibitory CC. C. An example of neurons that had sharp increase in CC within a short window. From Katz et al 2002. For example, panel A shows a neuron pair that had increased correlation during NaCl licking (mauve). While this pair had a change in CC, you can see that neuron 2 was not taste-selective. Of the 85 pairs of interactions identified, 67%of them included non-responsive or non-taste selective neurons. Panel B shows a loss of correlation between the two neurons, perhaps due to inhibition. Panel B also shows a pair that was responsive to two tastants; of the 87 neuron pairs, 50 showed significant CC for more than one tastant. Panel C shows a short timescale interaction of a few ms, overlaid on top of a broader CC of hundreds of milliseconds. These short timescale interactions occurred 17% of the time. Finally, they showed that neurons in different hemispheres could have CC. In the discussion they consider a few different sources for the CC, including common sources, coupled latency, or orofacial behaviours, but discard them due to the analyses I did not present. They mention that you could get changes in CC between neurons with different PSTHs (e.g. panel A), which shows this is due to CCs in single trials. Overall, they concluded that these CCs showed there was a population representation of GC information. I'm curious about the identity of these pairs of neurons. The recordings were performed blind to the cortical layer being recorded, and whether the neurons were pyramidal or interneurons. This information would be hugely useful. For example, if neuron B lagged neuron A by 50ms, it would mean entirely different things if neuron A was in layer 4 and neuron B was in layer 2/3, or vice versa. In the latter case (neuron A in layer 4), you could simply chalk the delay up to normal circuit function; if neuron A was in layer 2/3 though, this would imply some more complicated feedback processing. Similarly, when you see a reduction in CC, one might guess that the pair includes an interneuron. To get at this information, we're going to need more sophisticated tools to record from identified cortical neurons. In any case, those are the two papers from Donald Katz's postdoc in the Simon lab at Duke. He's revisited the theme of population coding many times (I'd recommend Jones et al 2007 for a Hidden Markov Model version of the story). Jusqu'à la prochaine fois.